Play is important. Research proves it. But really we just know it from personal experience, don’t we? Isn’t that why there is so much talk about work-life balance? It goes beyond just finding a happy medium between work and life, though. That life part also encompasses creativity. The time, opportunity, inclination, desire to pursue our hobbies and our passions. Whether it’s writing, painting, dancing, singing, the fun of taking part in these activities renews us. In fact, a review of literature by Heather L. Stuckey and Jeremy Nobel shows that art can help people renew when dealing with trauma: “Art helps people express experiences that are too difficult to put into words, such as a diagnosis of cancer.” Visual arts aren’t the only medium that can help. Music, movement and writing also have health benefits. If it’s true that creativity has health benefits for adults, why not encourage those benefits in children and nurture the desire to create? Creativity as a form of self-expression is inherent to our natures; however, it is also something that can be stifled. Healthy development includes the opportunity to express creativity. “All children need to be truly creative is the freedom to commit themselves completely to the effort and make whatever activity they are doing their own,” notes PBS. 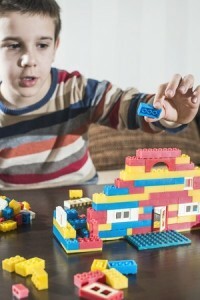 At Bricks 4 Kidz® we learn, build and play with familiar LEGO® Bricks in new and exciting ways. Our project kits and theme-based models provide the building blocks for fun educational play. Not only do we offer unique, specially-designed projects, but we also incorporate free-play time so that kids can expand their creativity and imagination independently.